The Newport Beach Table Tennis Club equal challenge gives beginner players a unique advantage against their more experienced competitors. Our custom points system allows beginners to advance confidently in the sport of table tennis, while at the same time giving seasoned pros the opportunity to flex their skills. This is an excellent and unique method for new students to gauge their aptitude, build confidence and focus on progress. In order to maximize the playing experience, we have put in place a strict set of guidelines that must be adhered to by all player. Inquire with our team for details. What do I need to play the Equal Challenge Tournament at the Newport Beach Table Tennis Club? Bring your table tennis paddle and your desire to play and win! Keep in mind that with our custom point system, beginner players have a better chance of winning the more they engage in table tennis. If this is your first time, then we urge you to cast aside the score and forget about the level of the other players. Your chance to shine is on its way! The key will be more times you participate, more chances you have. 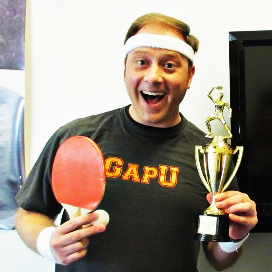 What are the mental traits that the Newport Beach Table Tennis community embodies in order to be good at this sport? Fix your schedule, we’ll guarantee you a lot of fun! How many player participate in the Equal Challenge Tournament? Each week is different but we can tell you an average of 15 players per week. How much Equal Challenge Tournament cost to play?